Our doe herd is small in quantity but high in quality; our bloodlines include: Mugambi, Farmworld, Amani, Harfield Bestboer, Micathel, Terraweena and Clearday Park; along with lesser known local studs Franklin Park and Coonong. 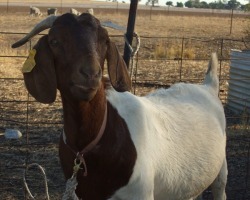 Charlotte is our leading lady here at Pacqio Boer goat stud. This girl is phenotypically outstanding, with good breed character and a fantastic maternal wedge. She has a stacked pedigree with Farmworld Warlord and Farmworld Apachie on the top, and Micathel and Eurongilly breeding on the bottom. Charlotte is also very special as she has defied the odds several times and survived two life threatening situations. For her maiden kidding, she gave us two buck kids who were trying to come out at the same time. Because of the tangle, Charlotte required a caesarian, which she pulled through with flying colours. She also recovered from a ruptured uterus at the same time. She raised two excellent kids. Around 9 months later, Charlotte became ill again and it was determined that scar tissue was impeding her ability to urinate, placing a large amount of stress on the bladder. Amazingly, she pulled through again, and although she requires daily medication for the rest of her life, she has rejoined the herd as normal. Charlotte was shown at Canberra Royal 2008, and placed 5th out of a class of 21 animals when she was only 6 months old. 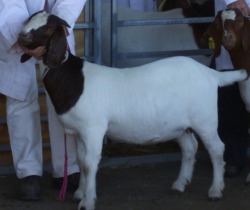 Due to her health obstacles, she has missed many shows, but was recently awarded Champion Boer Doe at Henty Show 2009. Dusty is known as 'Spot' at home because of a small red spot on her shoulder. We feel Spot is a high quality doe, who at the moment is going through a long, lanky 'teenager' stage. She is not done growing yet, and when she finished up, she is going to be a very big girl. She has an impressive pedigree with Amani Ningaloo and Harfield Bestboer on the top, and Mugambi breeding on the bottom. 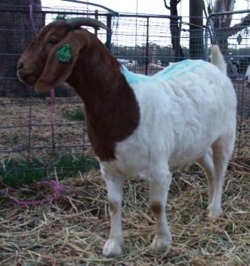 Her sire was Junior Champion Buck at Melbourne 2006 and her dam was Junior Champion Doe at Melbourne 2006. Her dam is close to our idea of perfection, with a fantastic feminine wedge, long deep body, strongly attached udder and excellent breed character in the head and front end. Vanity is a powerhouse doe; she is large framed, long bodied, deep, wide and solid. 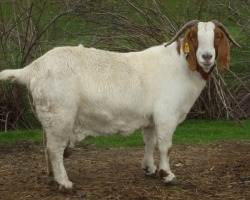 She is a very honest working type goat, and although she may not be pretty herself, she throws stunning doe kids full of breed character. She comes from the very successful Mugambi stud, with excellent South African breeding in her pedigree. Have a look at the pedigree of this doe, and that gorgeous head and front end! From the highly successful Micathel stud, out of a Terraweena buck, this doe is sure to impress. Linus is our newest addition to the herd, and we are excited to see the kids she can produce for us. Linus has an impeccable front end; she has a perfect head just oozing with breed character. A fantastic wedged, broody look, a long and deep body. Many thanks to Marie Barnes for allowing us to add Linus to our herd. Look at this! 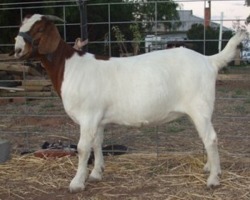 Matilda is an outstanding doe, imported directly from South Africa as an embryo, and bred by the successful Mugambi stud. Matilda is a long bodied, feminine doe full of breed character. She has not been shown due to udder injury, but has consistently produced show winning daughters. Calypso may not be the prettiest doe in the pasture, but she is a good honest, solid bodied doe. A former bottle baby, she is very people orientated and would rather be around people than other goats. What can I say about Calamity? 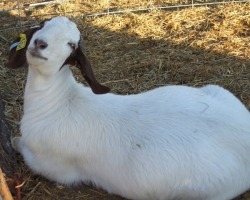 She embodies almost everything I am looking for in a meat goat. She is large framed and very heavy. She is long and deep bodied and very wide. She carries a large amount of muscling and is very easy keeping - she can get fat off just the smell of grass. Calamity is also a bit of a pet since she was bottle raised after her mother rejected her. 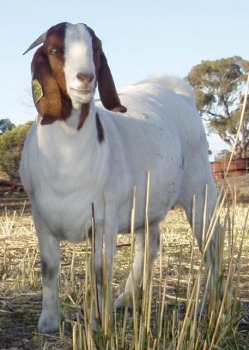 She has been shown at a local level, receiving Champion Commercial Meat Goat at Henty 2008 and 2009 as well as Culcairn 2008.